A list of install errors sometimes seen with Surfer is provided below. Click the error message you're seeing to view information about resolving the error message. "This App Can't Run On Your PC. To Find A Version For Your PC, Check With The Software Publisher." "There is a problem with this Windows Installer package. A DLL required for this install to complete could not be run. Contact your support personnel or package vendor"
"The program can't start because api-ms-win-crt-runtime-l1-1-0.dll is missing"
"The setup file may be corrupt"
"Error reading from file... Colors.ini"
"Error 1335. The cabinet file 'Data.cab' required for this installation is corrupt and cannot be used. This could indicate a network error, an erro ready from the CD-ROM, or a problem with this package." "Error 2350. FDI server error." "Error 1327. Invalid Drive: P:\"
"The requested operation requires elevation"
"_isXXXX.Tmp has encountered an error and needs to close"
"Overlapped I/O operation in progress." "Unable to find program Update file InternetUpdate.exe, try repairing the installation." This error may mean that the operating system on which you are attempting to install Surfer is not supported, or that the installation EXE file was not fully downloaded. The current version of Surfer requires Windows 7, 8 (excluding RT), 10 or higher. Additionally, sometimes company firewalls or virus checkers prevent the last few bytes of a file from being downloaded. If you can, try disabling the firewall or virus checker and then downloading the file again. If that does not help, please right click over the file you downloaded and click Properties. Note the file size of the file you downloaded (in bytes) and email this information along with the name of the file you downloaded to surfersupport@goldensoftware.com. Antivirus software removing the required DLL. The first thing to try is check your antivirus to see if any Surfer files have been quarantined. If they have, un-quarantine them, turn off the antivirus software, and then re-run the installer, making sure to choose the Repair option if it asks whether you want to remove or repair the installation. If you don't have the installer, you can download it from My Account. For Windows 10, 8.1, and 7, try is running this fixit tool from Microsoft: support.microsoft.com/fix-problems-that-block-programs-from-being-installed-or-removed. You don't have full access to C:\Users\<username>\AppData\Local\Temp. If you find that you don't have access to the temp directory, you can assign permissions to that directory by following these steps. If Windows isn't updated, you can follow these instructions to update it. The msiexec file isn't properly registered. If the msiexec file isn't properly registered, open the Windows command line and run 'msiexec /unregister' and then 'msiexec /regserver'. When you try to install Surfer, you may receive an error message stating "The program can't start because api-ms-win-crt-runtime-l1-1-0.dll is missing" (shown below). The issue is that the Microsoft KB2999226 (Universal CRT) which is part of the Visual C++ Redistributable for Visual Studio 2015 failed to install. In the Search Control Panel, type Windows Update. Install any updates that are available. Repeat this step until no further Windows updates are found. Manually Download the Visual C++ Redistributable. For Windows 64-bit, download this 64-bit redistributable file and this 32-bit redistributable file. For Windows 32-bit, download this redistributable file. Double-click on the downloaded EXE file. This is either vc_redist.x64.exe and/or vc_redist.x86.exe. After double-clicking on the EXE, select Uninstall. Double-click on the downloaded EXE file again. After double-clicking on the EXE, select Install. Reboot the computer if prompted. Install Surfer using the normal download instructions. Surfer requires the Microsoft Visual C++ Redistributables for Visual Studio 2015 to be installed prior to Surfer installation. If your machine does not include these runtimes, the Surfer installer will install them on your machine prior to installing Surfer. Manually download both the x64 and x86 files from Microsoft and install them. Run the Surfer installer again. Surfer will then install. "Error reading setup initialization file" or "The setup file may be corrupt"
The "Error reading setup initialization file" and "The setup file may be corrupt" errors when installing Surfer usually mean that the EXE file was not fully downloaded. Sometimes company firewalls or virus checkers prevent the last few bytes of a file from being downloaded. If you can, try disabling the firewall or virus checker and then downloading the file again. Please right click over the EXE file you downloaded and go to Properties. Confirm that the Size of the file you have matches what it is supposed to be. If it is not, please try downloading the file again. Potential causes are AntiVirus or Firewall software blocking a piece of the download. If that is the case, you may have to turn down the security settings or download the EXE on a machine that has looser security. Sometimes an installer package will have appeared to have downloaded successfully, because no error message was given about the download; however, you will not always receive an error message when the entire file was not downloaded successfully. When you run the exe file, it has enough information available to start running, but it will only get far enough to provide the error message shown above. Since it does not have the complete file content, it will not be able to read the setup initialization file. If you still have questions, please contact surfersupport@goldensoftware.com. Installation/Update Error: "Source File Not Found" Or "Error Reading From File...Colors.Ini"
The error messages "source file not found" or "error reading from the file... Colors.ini" indicate that there are still some old installer files left on your computer (they were not all removed during uninstallation), including the one in the error message (Colors.ini). This error is solved by deleting the folder in the error message, in addition to other folders containing Surfer installer files. Please complete the steps below to do this. If Surfer is not already uninstalled, then you can uninstall Surfer using the Control Panel | Uninstall a program function. After Surfer is uninstalled, open Windows Explorer/File Explorer. The path mentioned in the error is in a hidden folder, so double check to be sure you can see the hidden folders. Click Tools | Folder optionsin Windows Explorer. 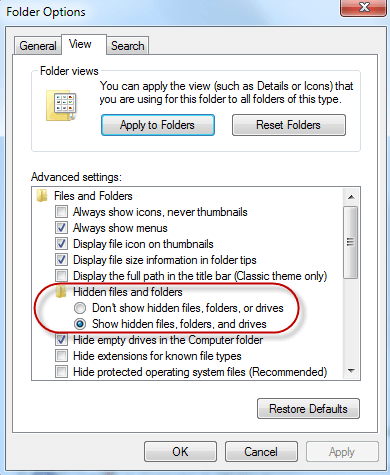 In the Folder Options dialog, click the View tab, and be sure Show hidden files, folders, and drives is selected and click OK.
Then navigate to C:\ProgramData\Golden Software. Delete the Surfer folder and everything in it. This will be any installer files for Surfer. Now navigate to where the update file was downloaded (e.g. C:\Users\(username)\AppData\Roaming\Golden Software\Surfer 16) or the full downloaded EXE file, right click over the EXE file and click Run as administrator. That will restart the installation process. "Error 1335. The cabinet file 'Data1.cab' required for this installation is corrupt and cannot be used. This could indicate a network error, an error reading from the CD-ROM, or a problem with this package." followed by "Error 2350. FDI server error". These errors indicate that the Windows Installer program is causing a problem. Please see this Microsoft article for instructions on how to update your Windows Installer. Once Windows Installer is updated, please reboot the computer and try installing the programs again. The error message “Error 1327. Invalid drive: P:\” indicates that there is an unrecognized drive letter assigned to your hard drive or CD. The drive letter will vary depending on the computer. This could be because the CD-ROM or DVD-ROM drive letter has changed since a previous install, or you have changed the drive letter of the hard disk that the operating system is installed on, for example, the C drive. To resolve this error you must re-assign the original letter to the CD-ROM, DVD-ROM, or operating system drive. A Google search for “error 1327” yields the following results: https://www.google.com/search?q=%22error+1327%22&btnG=Search&meta=site%3Dsearch. These sites report several ways to rename the drive letter on your hard drive and CD, depending on your version of Windows. The “The requested operation requires elevation” error when installing Surfer indicates that you do not have elevated privileges. This normally means the installation EXE file has not been run as an administrator, which is different than logging into the computer as Administrator. Windows Vista, Windows 7, Windows 8, and Windows 10 allow you to log onto the computer with administrator rights, and also run the program as administrator. Log onto the computer as the Administrator. Brows to the CD drive. Right-click on the setup.exe file and select Run as administrator from the pop-up context menu. Input the administrator password, if necessary and click OK.
Continue the installation as normal. Follow the download instructions you received, saving the file to your hard disk. Right-click over the EXE file and select Run as Administrator from the pop-up context menu. "_isXXXX.Tmp has encountered and error and needs to Close." The installer error: "_is1783.tmp has encountered and error and needs to close." may indicate that there is a problem reading the installation files on the Surfer CD. Others who have encountered this error have found that the problem may be resolved by copying the files from the CD or running the installation CD on another computer. "Overlapped I/O operation in progress"
If you are attempting to install Surfer and the install fails with an "Overlapped I/O operation is in progress." error message, it is most likely due to a Windows error caused by Microsoft security update KB2918614. Microsoft recommends applying a hotfix released to address this issue. Refer to "The profile for the user is a temporary profile" error when you install a MSI package in Windows for the Microsoft hotfix. On the left side, click View installed updates. In the search box at the top-right search for KB2918614. Click on the update if it is found and uninstall it. Repeat steps 4 and 5 for KB3072630, KB3000988, and KB3008627. Reboot the computer and try installing Surfer again. If repairing the installation does not work, it is likely because this executable file accesses the internet and it is being blocked by an antivirus software. Please ensure the InternetUpdateu.exe file has been removed from quarantine then, try repairing the installation again. If you continue to have trouble, please contact support and include your product key or serial number. If I automatically download the update for Surfer, but cancel the installation, is the file saved somewhere on my computer?